Kenise Adams has earned a master of science degree in higher education and student affairs administration, attaining a 4.0 GPA while being actively involved in the campus and global communities. Adams will receive the SUNY Chancellor’s Award for Graduate Student Excellence during the 6:00 p.m. master’s hooding and C.A.S. ceremony at Buffalo State’s 144th Commencement, Saturday, May 14, in the Sports Arena. Driven by a positive attitude and a keen sense of the needs of others, Adams brings a critical inquiry perspective and skill set to a research setting that rivals most doctoral students. Her attention to detail is impeccable, and she uses her strong quantitative and writing skills to explore issues of professional development, social justice, and socioeconomics. Adams is particularly passionate about international students and their experiences. After learning of the struggles of international students while working at the International Student Services Office at Buffalo State, she conceived of and developed the college’s International Student Mentoring Program to assist first-year international students in their transition to campus. She has shared and expanded her knowledge of the higher education field by conducting seven presentations and attending six conferences in a two-year period. 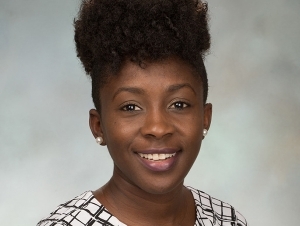 Involved with groups at the state and national level, she was selected as one of five SUNY student fellows at the 2015 SUNYCON conference, engaging in system-level discussions on issues in higher education. She also served as an American College Personnel Association mentor and brand ambassador. On campus, Adams has demonstrated leadership in action as chair of the Professional Development Committee of the Graduate Association of Student Personnel Administrators and as a resident director, supervising 20 resident assistants. She is a poised leader whose care and commitment to the successful development of students is evident in her dedicated work as a scholar and a professional.